"The Great Schism is upon us. The unbreakable Covenant Writ of Union has been split asunder. This is the end of the Ninth, and final, Age." Xytan 'Jar Wattinree was a Sangheili Imperial Admiral who commanded the Combined Fleet of Righteous Purpose. He led the Sangheili forces during the early stages of the Great Schism. As evidenced by his extraordinarily high rank of Imperial Admiral, Xytan 'Jar Wattinree was an incredible warrior. It is said that he had never been defeated in battle, that he had never failed at any task, no matter what the challenge, and that he was never wrong. He came to be so revered, however, that some held him above any Prophet. For this, the Hierarchs exiled him to lead the Combined Fleet of Righteous Purpose, which guarded only the fringes of the vast territory possessed by the Covenant Empire. At the outbreak of the Great Schism, Wattinree was among the first Sangheili leaders to rally his people against the treacherous Jiralhanae, who had supplanted the Sangheili as the Prophets' protectors. 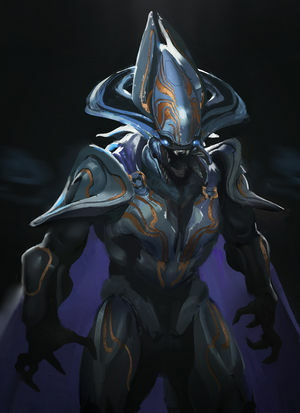 Wattinree and several other Sangheili leaders met at the colony planet Joyous Exultation, where they planned to ambush and destroy the Jiralhanae, putting an end to the Great Schism, though he still clung to the Covenant's religious beliefs and thus plotted to wipe out the humans and their Spartans. At Shipmaster Voro 'Mantakree's urging, the Imperial Admiral recognized that destroying the Flood was a more pressing matter. Wattinree promoted 'Mantakree to Fleet Master of the Second Fleet of Homogeneous Clarity and renamed him "Voro Nar 'Mantakree"; while this promotion was ostensibly made in good faith, Wattinree actually intended to rid himself of his greatest rival. Wattinree's flagship, Sublime Transcendence, was destroyed along with two-thirds of the nearby fleet, Joyous Exultation, and the moon Malhiem, by a UNSC NOVA bomb that had been taken from Reach. Wattinree was atomized in the blast. Following Wattinree's death and the end of the Human-Covenant War, Sangheili Shipmasters serving with both Jul 'Mdama's reformed Covenant and Arbiter Thel 'Vadam's Swords of Sanghelios would continue to study battle recordings of his tactics. While Xytan was not present at the Fall of Reach itself, it was theorized that his brilliance combined with the audacity of Supreme Commander Thel 'Vadamee would have made for a devastating combination during that battle. Amongst the soldiers of the Covenant, particularly the Sangheili, Xytan 'Jar Wattinree was a living legend. The fact that he was so revered that he was sentenced to exile was said to be his only flaw. This act of betrayal clearly embittered him against the Covenant even while he remained a part of it. This, along with his superb leadership, explains why he was so prepared to take action against his former San'Shyuum masters when the Great Schism broke out, compared to the majority of the Sangheili leadership, who were too stunned by the Prophets' betrayal to do more than defend themselves at the time. Wattinree was confident, powerful, and extremely charismatic, though he was also suspicious. When he was publicly contradicted by Voro 'Mantakree - an act for which he could have had 'Mantakree executed - he not only conceded to 'Mantakree's point, but promoted him to Fleet Master of the Second Fleet of Homogeneous Clarity and assigned him with protecting the Forerunner artifacts on Onyx from the humans. Wattinree thus shrewdly prevented his greatest rival from undermining him whilst inspiring zeal in his followers, maintaining his air of wise leadership. Unlike Thel 'Vadam and the Swords of Sanghelios, Wattinree retained a distaste for humanity even after the betrayal of the Prophets and continued to have his forces oppose them. Imperial Admiral Xytan 'Jar Wattinree is available as a Fleet Commander in Halo: Fleet Battles for 120 points. He is able to use four Zealots every full 1,000 points at the cost of 25 points each. Description: An element may re-roll up to two Halo attack dice. These dice may only be re-rolled once. This order is issued after any initial dice are rolled during either the attack segment or the boarding resolution phase. Description: An element may re-roll a single initial defense array die rolled by an element. This die may only be re-rolled once. This order may be issued after any initial defense dice pool roll. Description: The Fleet Commander may order the re-building of a battle group up to a maximum build rating of 6. This order must be issued during the execute orders step of the order dice phase. Description: The Covenant Fleet automatically gain the initiative this turn. This order may be issued during the execute orders step of the orders dice phase. Description: Increase the security detail rating of all zealots in a fleet by +2 for the remainder of the turn. This order must be issued during the execute orders step of the boarding resolution phase. A gifted military opportunist, Xytan 'Jar Wattinree is capable of taking advantage of the slightest flaw in an opponent's plan. During the execute orders step of the orders phase he can force the opponent to re-roll a single order dice each turn, but the second result must be accepted. ↑ Eric Nylund, the author of Halo: Ghosts of Onyx, has suggested that Wattinree's immense height may have been an illusion caused by the use of a ceremonial headdress, "platform shoes", and holographic manipulation. Check out our collection of quotes related to Xytan 'Jar Wattinree in its quotes page.